Mark Baker is a farmer and rancher at Patriot Baker’s Green Acres in Marion, MI. 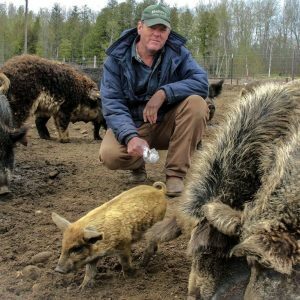 Born in the heart of Revolution country, Massachusetts native Mark Baker began his farming career while still employed full time in the U.S. Air Force, raising hogs in a farrow to freezer operation, chickens, turkeys, and beef. He and his family have raised produce and animals to sustain themselves as well as to sell for over 15 years. When he retired with 20 years military service and moved to Michigan in 2004, Baker’s Green Acres become a full time occupation. With a focus on raising animals on pasture, he has centered production on pastured poultry and on heritage Mangalitsa cross-bred pigs. He is a vocal proponent of locally produced food and the use of sustainable production methods. 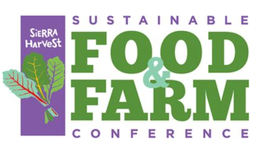 He sees education of consumers and growers as the key to food sovereignty. Mark feels strongly about the revolutionary idea that consumers have the right to eat wholesome, farmer direct food. With that passion, Mark recently took on Michigan’s Department of Natural Resources to defend farmers’ rights to raise heritage breed hogs. Mark was the Keynote Speaker at the annual Farm to Consumer Legal Defense Fund Annual Dinner and Fund Raiser recently held in November.